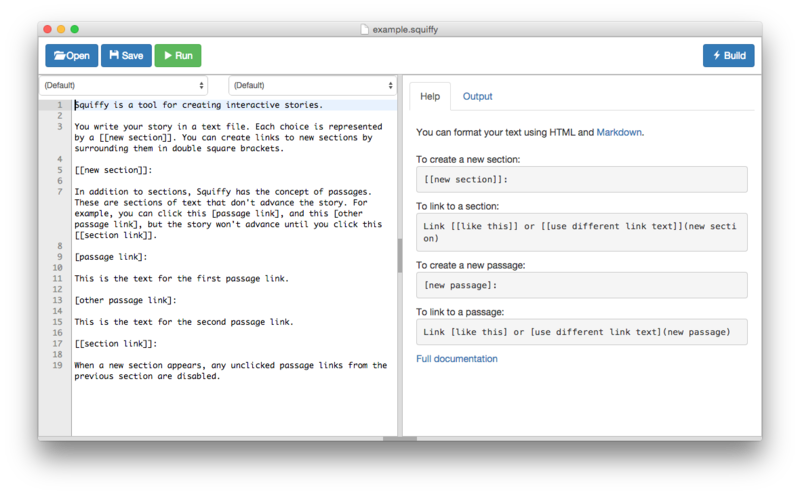 Squiffy 5 is now available – you can use it in your web browser, or download it for Windows, OS X and Linux. This release makes various enhancements to the Squiffy Editor. The number one request by far has been to add an option to change the font size – so that is now done! It’s now easier to work on larger games. You can collapse sections and passages, so it’s easier to focus on just the one you’re currently editing. The section and passage lists at the top of the screen are now searchable. You’ll find shortcuts to collapse and uncollapse all sections and passages on the new Tools tab. This also features new shortcut buttons allowing you to easily add new sections and passages. Let’s say you’ve written a paragraph of text and want to add a link to it. Now you can simply select the text you want to link, hit “Add section” or “Add passage”, and a new section or passage of that name will be created, with the text linked to it. Try it out… Squiffy works in your web browser without downloading anything, or you can download versions for Windows, OS X and Linux. This entry was posted in Uncategorized on November 14, 2015 by textadventurescouk. Squiffy 4 is now available. This release brings the editor to Windows, OS X and Linux, so you can now create and edit games offline. 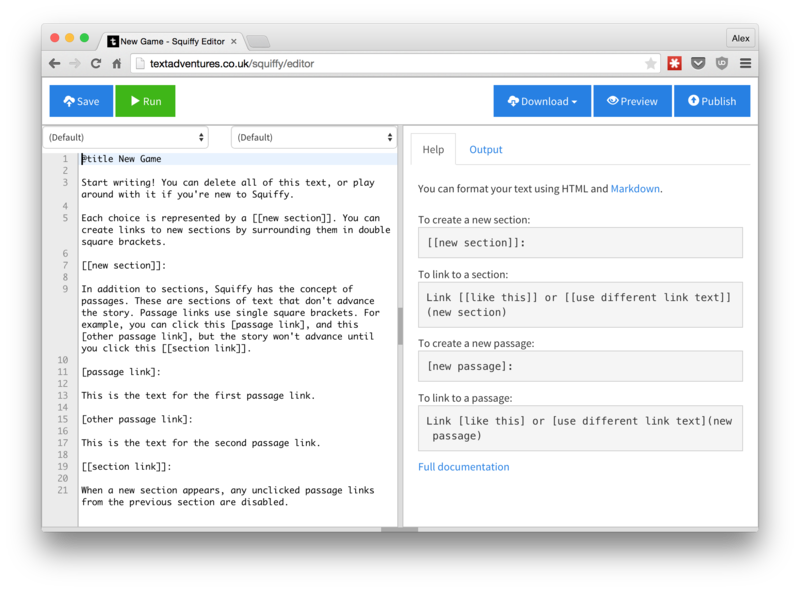 Squiffy is a simple system for writing multiple-choice interactive fiction. It publishes to HTML so you can upload your game anywhere. The quickest way to see it in action is to check out the documentation, which has a load of live examples – you can see the code and the results in the same place, and play around by editing the examples in the ScratchPad. The new desktop version of the Squiffy editor takes the web-based editor (created for Squiffy 3) and wraps it up using Electron. It’s exactly the same code, so all future improvements will be available in both the web and desktop versions. What sort of future improvements? Well, we’re nearly at the end of my Squiffy Roadmap now, but this is just the beginning. Now we have a fairly simple editor across all platforms for what is still a fairly simple system, we can start to flesh out the features a bit. I’d like to add a graphical view showing how a game’s sections and passages connect to each other, and I’ve got various ideas for how the editor could assist you with building a game – making it a one-click operation to add new sections and passages, showing you which sections and passages are empty or missing, etc. All feedback, suggestions and pull requests are welcome! This entry was posted in Squiffy on July 11, 2015 by textadventurescouk.